Minority Rights Group welcomes your recent visit to Papua, as well as your report and your recommendations to the government of Indonesia. We share some of your concerns regarding the health of indigenous communities in this region, in particular those regarding maternal health of Papuan women. MRG welcomes the publication of ethnically disaggregated statistics on maternal health by the government of Indonesia. We note that these statistics suggest significant disparities in terms of health services accessed by indigenous women compared to women of non-indigenous origin, with Papuan women benefitting from significantly less access to health services. The report mentions that these disparities are not reflective of lower budgets or spending. Our research suggests that the reason for this disparity may be a lack of trust or accountability between service providers and indigenous communities. West Papua is an example of a situation where providing maternal health care is complicated by conflict and distrust between the authorities and many indigenous women. We therefore suggest that the government of Indonesia focuses on finding ways to rebuild trust between the communities affected and the statutory service providers. This is not easy in the context of a high and controversial military presence. But we note that reducing the military presence, ensuring that the military are held accountable for their actions and, when providing services, seeking to work through trusted inter-governmental organizations, local NGOs and non-state actors may be useful starting points to address the situation. We would also like to echo the recommendations made in the joint civil society statement delivered by Franciscans International a few minutes ago. In particular, we hope that Indonesia will build on this visit to allow more independent monitors to visit all parts of the country and report on the situation in West Papua. 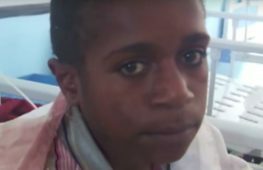 Photo: Young Papuan woman (still from the MRG youtube video of the West Papuan massacre).